Directorate of Handicrafts & Handlooms (DHH) was established in 1957 in order to promote manufacture and sale of various handicrafts, carpets, furniture etc. It's located at the zero point and about 1km from MG Marg. If you take the Tibet road from MG Marg, go straight up and at the end you will find the Handicraft center at the crossing. The main building in front houses the training centers for various handicraft items. It also has a museum which was opened in 2007 to showcase many artworks and items which are created in this center by local artists and artisans. Behind the main building, there is a 2-storey Sales Emporium where you can buy various products created at the center. Take the stairway of the front building and go to the first floor. 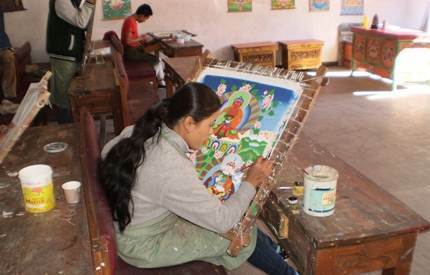 Here you will be able to see many trainees undergoing training in various artwork while many artists and craftsmen are making the handicraft products. I was told most trainess here are deaf and dumb, or have some disability. You can freely move around without making noise ... the trainers or the trainees won't mind that, neither they will object if you take some pictures. 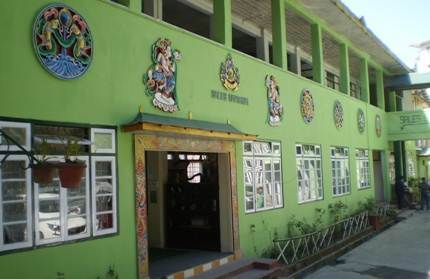 There are presently 32 such training centers of DHH through out Sikkim having close to 700 trainees, and 13 production units. Pay few minutes visit to the weaving and Thanka (religious scroll painting) rooms. So what types of products do they make at the DHH? Actually the range is mind boggling. Cane products such as fruit baskets, strainers etc, hand carved foldable tables known as Choktse, masks, thankas which are scrolls with exquisite hand paintings, dolls like yak dolls, red panda dolls etc, wooden lamp stand, handcrafted wood framed mirrors, Lepcha hats, intricately designed woolen carpets etc. A unique novelty of the place is the hand made paper which is made from the bark of the tree Argali. This paper is extensively used in greetings cards and letter pads etc. Some of the handloom products here includes traditional dress materials of Neplai women and men like Dhaka Sarees, Dhaka Choli, Daula Surwal, Dhaka Topi etc. You will also get Lepcha bags, embroidery products and lot more. The museum is also located on the first floor. A charming lady here will take you around the museum showing you not only the samples of many artwork create at this center itself, but also several antique and rare collections which were created by legendary craftsmen and artists. But I thought the most awesome piece here is the 300 years old hand carved wooden pillar made of magnolia wood. This red pillar with many intricate designs on it was made out of single trunk of a tree. It serves the memory of Chogyal Dynasty in Sikkim and was presented to the Handicraft Center by Phodong Monastery of North Sikkim. Photography is not allowed inside the museum. Admission ticket is Rs. 10 per person. DHH is open from 10am to 4pm daily except Sundays and Government holidays.